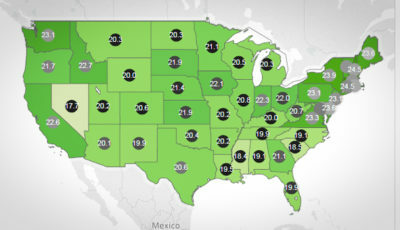 Where do you get your daily news for K-12 public education in Alabama? Do you wait for it to come across your internet feed? Hunt for it on al.com or your local newspaper or digital news site? Check your Twitter feed? Coverage of K-12 education news is inconsistent in Alabama, and it’s tough to stay ahead of the really important stuff that affects our families. In fact, that is the primary reason for the Alabama School Connection’s existence. However, there are two organizations doing a great job pulling together news about K-12 public education in Alabama through their daily news digests. 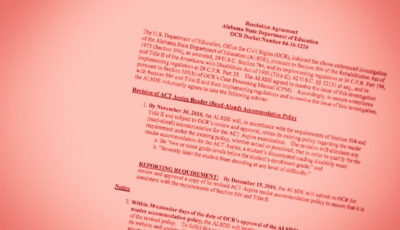 Alabama Arise Citizens’ Policy Project offers a free daily news digest, rounding up news relevant to the subjects upon which they focus, one of which is public K-12 education. Here’s the link to join their email list. Here’s a link to their weekly news digest, an aggregation of the previous weeks’ news. Sure Alabama Arise has a policy agenda. Whether or not you agree with their agenda, their news digest is unparalleled in making it easy to keep up with the news pertaining to K-12 public education in Alabama. 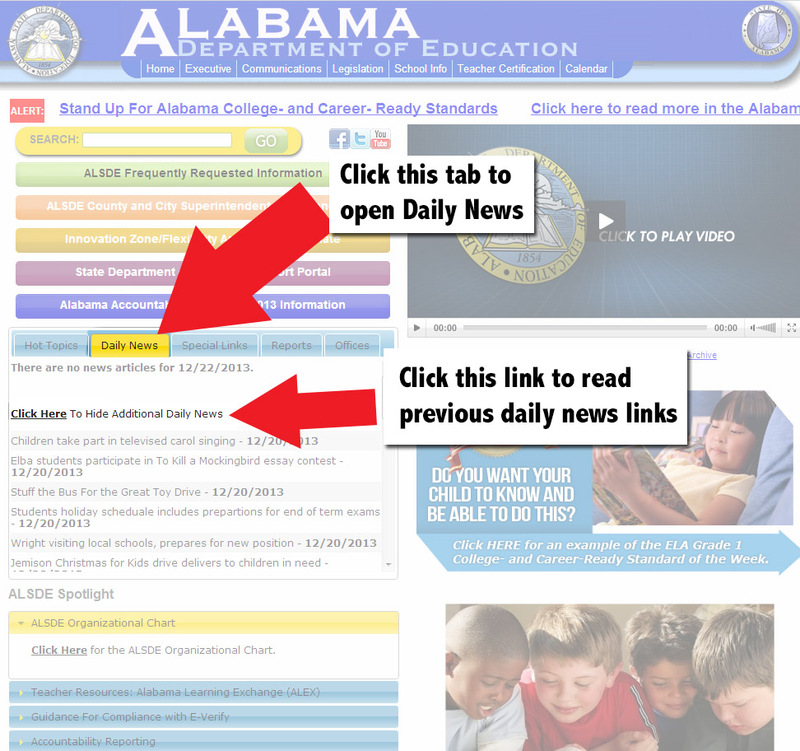 The Alabama State Department of Education (ALSDE) offers free access to daily news links on their web site as well, though mostly what you’ll find is the good news about Alabama’s K-12 public schools. [Yep, they have an agenda, too.] They don’t currently offer an email subscription, so see the image below for how to find their news links. No other statewide K-12 public-education-related daily news digests exists, to my knowledge. If you know of one, please post here or on the Facebook page. I’m a big believer in perusing various viewpoints in order to have a full view of a subject: the old “there are two sides to every story” thing. For those of us using Google search to find our news, a warning and a remedy: After being alerted to the “filter bubble” that can build around you as you click on items on the Internet, I was pleased to find the ability to switch back and forth between Google’s personalized results and results without your personal information algorithm. 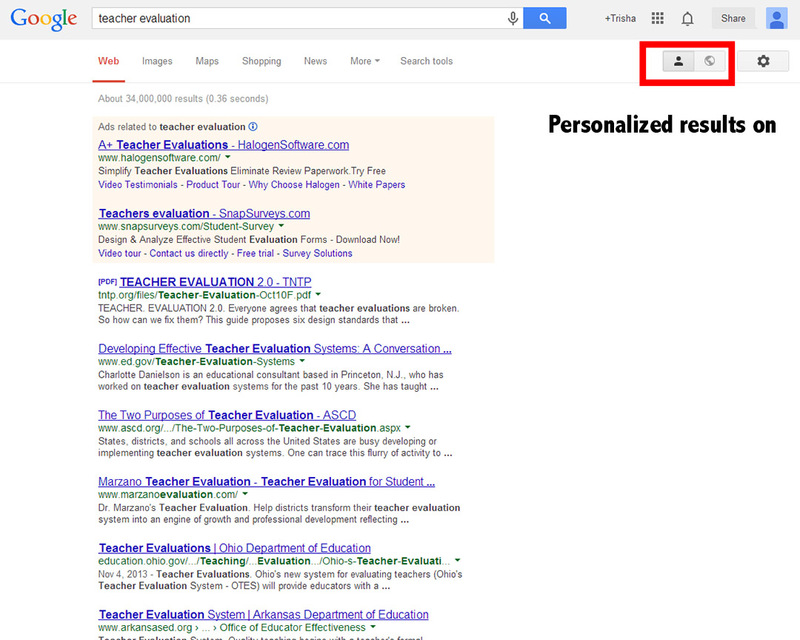 Look for the toggle switch in the upper-right-hand corner of Google, noted by the red square below. 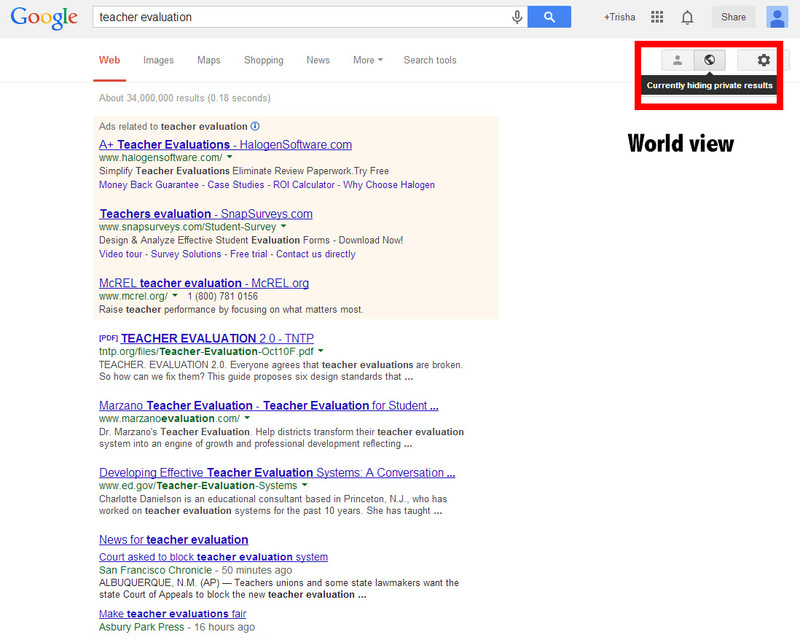 The two images below depict the difference between the two when I searched for “teacher evaluations”. 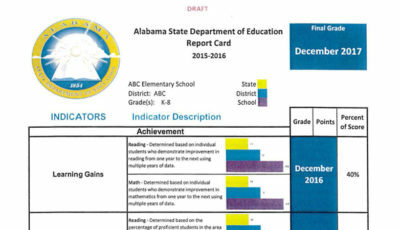 Not a whole lot of difference, but my personalized results show state-level department of education information for states other than Alabama, which is a direction I often take. 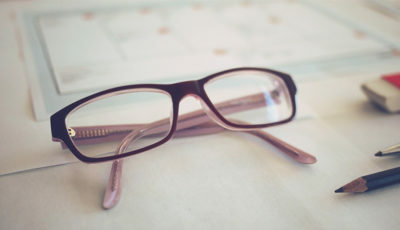 So if you are interested in all things K-12 public education, these two daily news digests will help you stay abreast of the latest news. As always, the ASC will be here to provide in-depth coverage of the less-covered issues in public education. Do you have an issue in K-12 public education in Alabama about which you would like to learn more? Comment here or on the Facebook page to let me know. 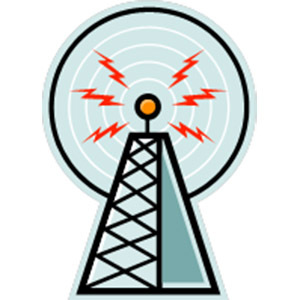 aplusala.org is also an excellent source of K-12 information and news in Alabama. It provides a good monthly recap of the news, and any just-in-time Ed-news important to its readers. Ha! Now more often than not I rely on you, Trisha, for getting the news!